Casino Night 2013 – What to Wear? Off to Allen & Shariff Casino Night 2013! Grab that Hawaiian print shirt you bought on vacation and get ready to hula. A Hawaiian print shirt or dress is the most obvious and easiest piece of clothing that you could wear to a luau. Pair the shirt with some nice khaki shorts, or for women, a casual jean skirt. Another good option is a nice tank top or T-style shirt that has a Hawaiian print. Okay, so you you might match the tablecloth, but that’s the point. Luau’s are festive events full of color! A traditional sarong is also a great wardrobe option for a luau. There are more than 20 ways to tie a sarong; it can look like a sundress or a skirt. You can pair it with a cute tank top, or if the luau is a pool party, a sarong is a great piece to use to cover your swimsuit. You’ll arrive in Hawaiian style and be ready to enjoy the fun. A sundress for a woman is also a really good idea. If you have a floral-print one, that would be more festive. 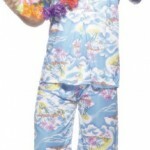 A brightly colored shirt with a Hawaiian printed or floral skirt is an easy way to dress festive for a luau. You may just have these items in your closet. If you are anti print opt for bright colors; it gives you a solid choice without being to floral. If the budget is thin and you don’t want to buy anything, you can always try a simple solid-colored shirt or tank top with a pair of board shorts. 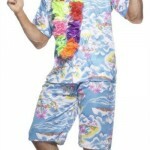 This is a more surfer-style look, but Hawaii is known for its surf, so this is actually a good option. If you are really in the spirit and don’t mind doing your best hula, you might as well get out the ole grass skirt from Halloween–just don’t forget to wear a bathing suit or shorts under the it. Pair it with a pukka shell necklace, and you can’t get more festive than that. Girls may even want to put a flower in their hair to add a finishing touch. Try to go for a more tropical flower such as an orchid or lily. Off to Allen & Shariff Casino Night!